There is a strong sense of family and community in this part of the world. Hedgehogs and badgers mingle with foxes and deer under the shadow of the mountains, whilst squirrels and owls chatter in the treetops. On clear nights, the animals often wander down to the river to bathe in the crystal waters, or to take part in stone skimming competitions. Life here is all about outdoor fun and adventure and little critters are taught survival skills from a young age. 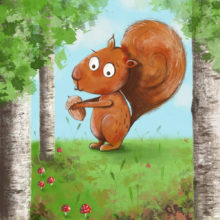 Foraging, orienteering and navigation are all taught in forest school and you can often see the red squirrels playing hunt the acorn. The animals of The Wild are hopeless romantics (something to do with the combination of moonlight, berry pots and secluded corners) and like nothing better than snuggling up with their nearest and dearest or watching the sun go down from a rocky outcrop. Don’t be fooled though! These creatures are also fiercely independent and make time to enjoy their own company where they can be found creating landscape art with materials picked up on their travels.